﻿ PORTWELL LAUNCHES AN ADVANCED SFF EMBEDDED SYSTEM BOARD WITH INTEL® CELERON® PROCESSOR J3455- Portwell, Inc.
WUX-3455 Is an Embedded System Board with Powerful Parallel Computing Providing Visual Communications and Real-Time Computing Solutions in Digital Signage, Automation, Medical and IoT Applications. 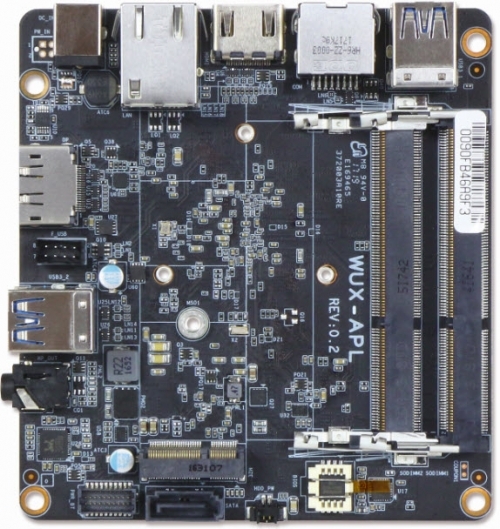 Portwell, Inc., (www.portwell.com.tw) a world-leading innovator for Industrial PC (IPC) and embedded computing solutions, and an associate member of the Intel® Internet of Things (IoT) Solutions Alliance, today announces the launch of WUX-3455, a small form factor (SFF) embedded system board featuring the Intel® Celeron® processor J3455, formerly codenamed Apollo Lake. The Intel® Celeron® processor J3455 integrates the low power Intel® Gen9 graphics engine up to 18 execution units, enabling enhanced 3D graphics performance and greater speed for 4K encode and decode operations. Its ingenious and effective design, plus low power consumption make the WUX-3455 a perfect building block for solutions supporting visual communications and real-time computing applications in medical, digital surveillance, industrial automation, office automation, retail, and more. Portwell’s WUX-3455 embedded system board, designed with a compact footprint (101.6mm x 101.6mm; 4˝ x 4˝), also features DDR3L SO-DIMM up to 8 GB supporting 1866/1600 MT/s; 6x USB ports; one DisplayPort (DP) and one HDMI with resolution up to 4096 x 2160; one COM port for RS-232 on rear I/O (RJ45 connector); and multiple storage interfaces with 1x SATA III port, 1x microSD 3.0 socket and support for onboard eMMC 5.0 up to 64G. Moreover, it integrates the M.2 interface, which provides wireless connectivity including Wi-Fi and Bluetooth, allowing ideal communication and connectivity for IoT edge devices and designs. The Portwell WUX-3455 delivers robust performance, yet it operates with thermal design power (TDP) under 6W/10W for fanless applications. It also supports a wide voltage of power input from 12V to 19V for rugged applications. With its ingenious design and superior performance—up to quad-core processing power via Intel® Celeron® processor J3455 and high capability—the Portwell WUX-3455 embedded system board is equipped with the ability to execute an extensive array of applications from digital signage in public spaces (stadiums, museums, transportation systems, corporate buildings, healthcare facilities, retail stores, hotels, restaurants, and more), through manufacturing robots and machinery transforming industrial automation, to video analytics-based appliances enhancing intelligent digital security and surveillance, to end-to-end solutions for the ever-evolving and ever-expanding IoT use cases. WUX-3455/3350/4200 builds on Intel® Atom® Apollo Lake SOC and takes advantages of Intel® Pentium® and Celeron® Processor support Dual/Quad Core (up to 10W) that can support dual channel DDR3L memory. Support one Gigabit Ethernet port and one M.2 socket and wide voltage of power input from 12V to 19V.